Office hours are in session. And there are cookies. Allison Agsten, director of the Main Museum, sits patiently at a glass bistro table in a historic former bank building downtown. The lobby, with its polished tile floor and soaring ceiling, is being renovated into the Main; it's mostly vacant but for a tidy reception area on one side and Agsten's minimalist working space on the other. Agsten sits with her hands crossed on her lap as local artist Cynthia Minet unwraps a large, framed drawing of two hawks in the air. On the table is a vase of fresh flowers, a plate of chocolate chip cookies, an open laptop and pink file folders housing Agsten's notes. The vibe is arts administrator-meets-high school guidance counselor-meets empathetic best friend. "It's a double hawk piece," Minet says, enthused and nervous at once. "I do studies for my sculptures to work out the gesture and the feeling." 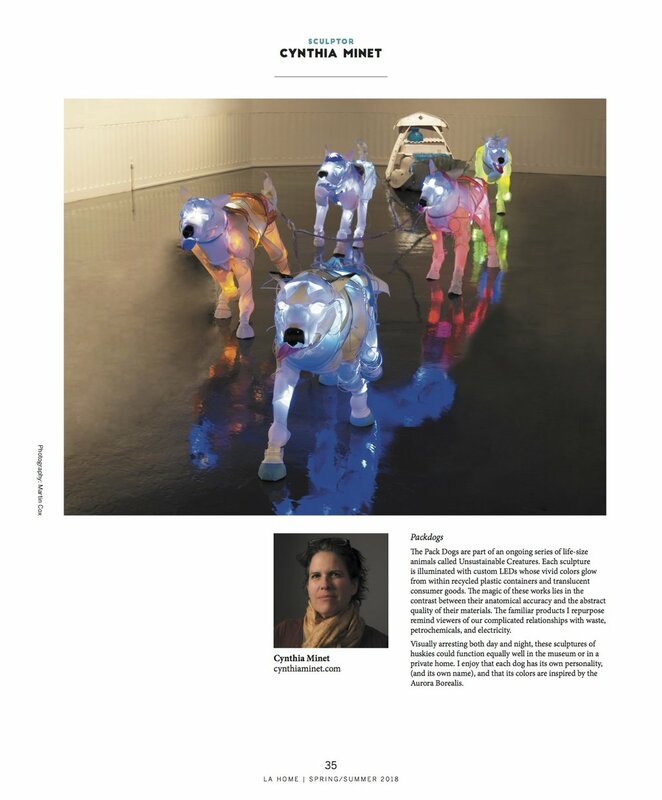 Agsten says Minet's process is interesting and nods to pictures on the laptop of the artist's illuminated, recycled-plastic animal sculptures. "I have an upcoming project at the Craft & Folk Art Museum," Minet says to the reporter, "and Allison and I were just talking about how I can use some of this sensibility in combination with what I'm planning to do." The meeting is part of the museum's annual "Office Hours" program, now in its second year, in which the first 50 artists who signed up have scored a one-on-one chat with Agsten to review their work. 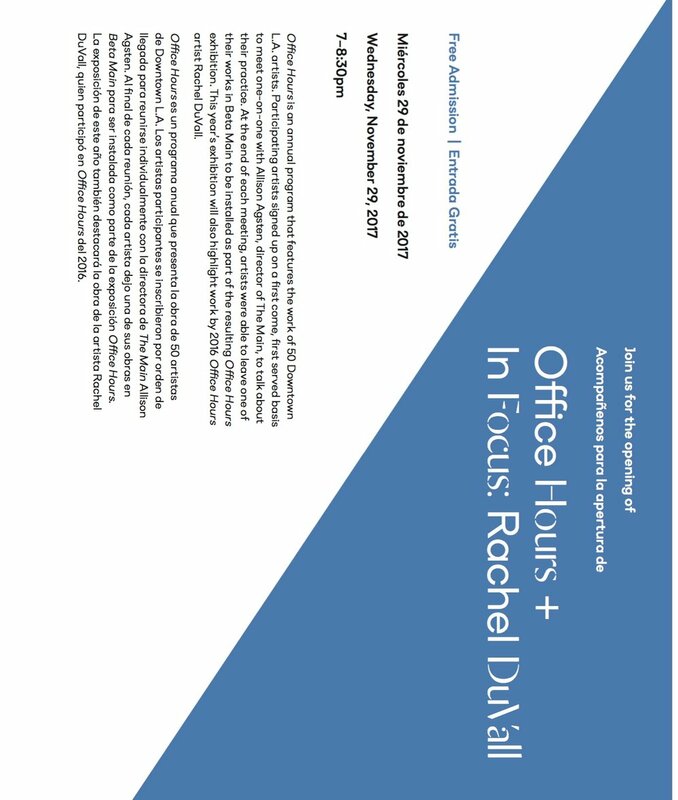 A 2 1/2-week "Office Hours" show opens Wednesday evening in the museum's lobby gallery. As their talk winds to a close, Agsten leans in, concerned. "My one question that I like to end on, that I ask everybody, is: What do you think the most pressing question is for L.A. artists right now?" "Oh my goodness," Minet says, without skipping a beat. "Rent. Downtown it's really a problem. People are being pushed out of their spaces." Agsten listens, intently, nodding and occasionally scribbling notes. The conversation wraps up with the two embracing. "Take a cookie with you," Agsten says, seeing Minet off. Last week I had the pleasure of chatting with Allison Agsten about my work. It was a fruitful conversation, and I will have a drawing in this upcoming show. SO, finished the frog. Off it went to Raleigh, North Carolina. Picture below. Now I am contemplating my next project. This is to be a brand new, large (60 ft?) installation for the International Museum of Art and Science in McAllen, TX. Planning on making a visit this summer to research. The show will open in March 2018. Seems like a lot of time, but NOT REALLY! Cannot wait to get started. Will post some pix as soon as I have some drawings. Picturing 10 life-size spoon-billed egrets, swooping down to land. Imbedded in them, some artifacts from the borderlands. Thoughts on a liminal space. I am reading H is for Hawk. I have started a commission piece, my first in many years, and my first animal out of recycled plastics. It is an enlargement of an endangered tree frog. It is commissioned by another artist, Joyce Dallal. She is working with a group called the Disappearing Frog Project, based in Charlotte North Carolina. My sculpture is to be a gift. I have made an articulated skeleton/armature for it, and am in the process of adding on the form. So. I am going to be posting the process here. Here is the articulated skeleton, made with modified PVC fittings and InstaMorph. Here is what I have so far, not bad for Day 2 on the project. Recycled kitty litter containers. I am growing attached to those eye sockets, even though the whole head is a bit large. I have to stay with 18 x 18 x 18 inches to fit on the pedestal. Given that these tree frogs are about the size of my thumb, I have had to make a proportion scale. My 12 year old daughter showed me how to do it mathematically...5 cm =6.5 in. 5cm/6.5 in x 3cm/x for example. It works out nicely. Measuring off a Turbosquid model of a frog skeleton on the computer screen, and a video on endangered species.